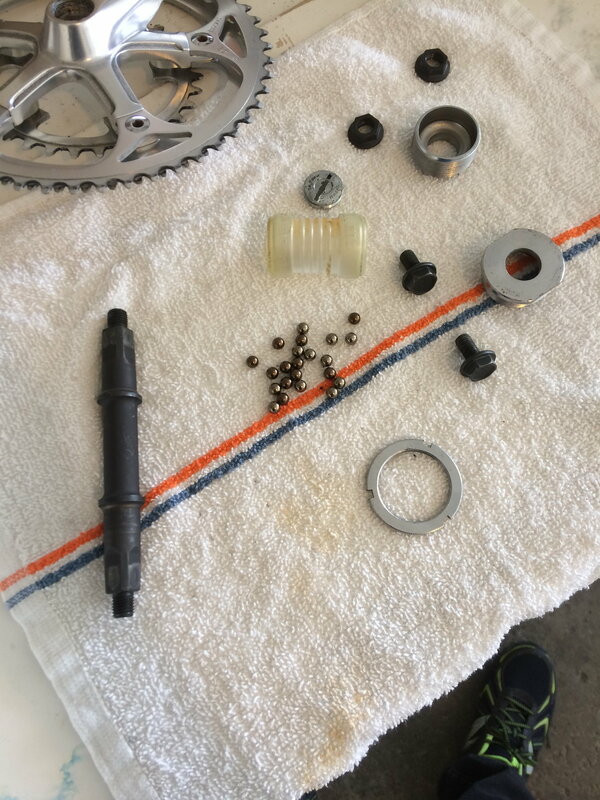 100 replies....100 more things to go wrong as I pull the 165mm cranks off the Fuji today and inspect the bottom bracket that wont turn more than 1cm at the pedals. Stay tuned. It wasn't what I was looking for, but it's what I got. They had some big trees topple over in the hurricane, so most of the dump is inaccessible. 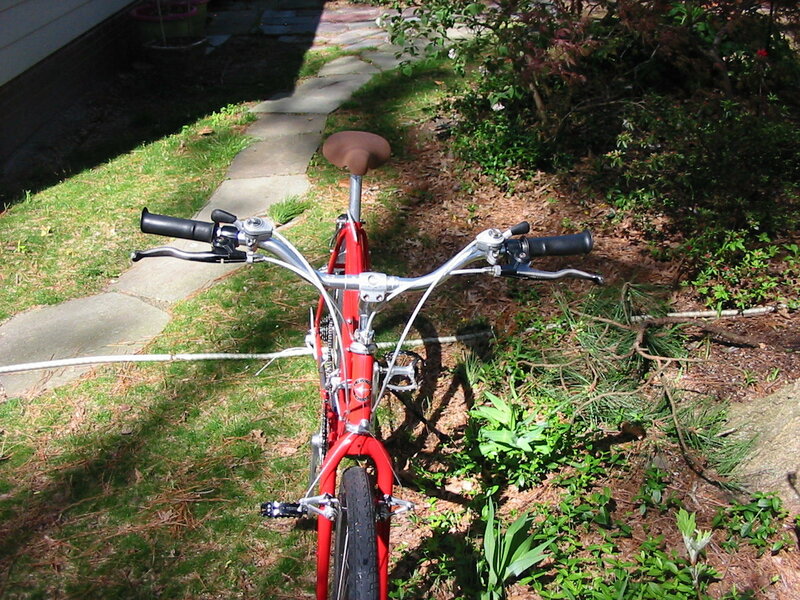 At any rate, it's all there: low budget Suntour Accushift, Lee Chi Sine Power brakes, and plastic brake levers. Perfect! I'll give it an overhaul this weekend and try to go the 100K in one shot. I don't have a lot of free time for riding these days, and to be honest I don't want to spend it riding this! I may jump into this, but maybe I'm just happy with a score this morning and gloating, too. I thought about this contest and have been scouring Craigslist for a likely entrant. I'd had my eye on an old Peugeot that had been modified by an earlier owner (and posted about here: Help Identifying a Peugeot). I wasn't able to go look at the bike for a while because the seller was out of town. This morning I went to get the Peugeot figuring that $100 would be a good deal and a good place to start a restoration/restomod project. When I got there I found out that the rear hub was missing a spindle so I made an offer of $100 (the asking price was $120). The offer was accepted and I got a Lotus America as a throw-in on the deal. 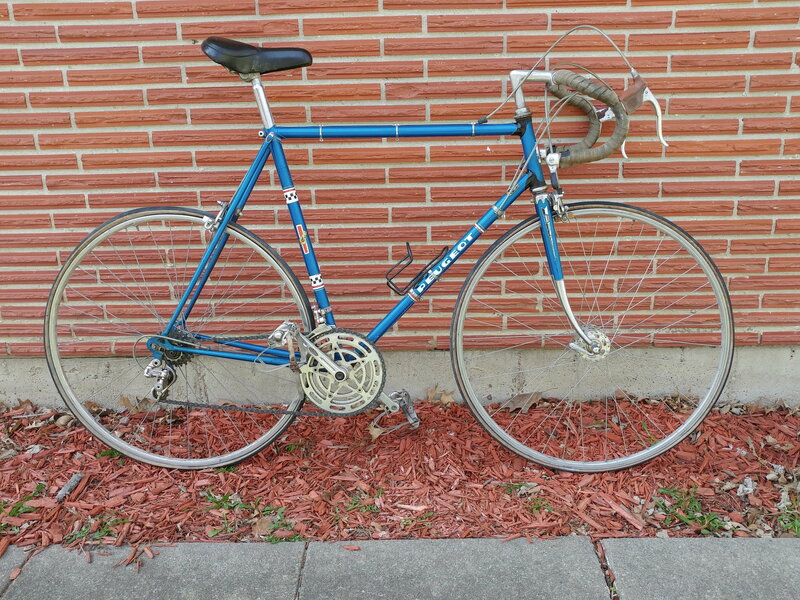 Two bikes for $100 with some desirable parts (the Lotus has Campy hubs, for instance). I may actually be able to enter. Well, Fuji time. Or was that 'Fudge-it' time? I wanted to strip everything down to the frame just to see what the thing weighed. That was the excuse any way. By the very first thing, I could tell we were off to a great start. I made this great little tool to clean threads, and it works pretty well. I had a recent experience stripping crank threads, so not going back there again. Fresh threads and a fresh crank pulling tool. I found at an interesting thing. It has fake head lugs! Which I don't mind, because it is interesting. Now that her deepest, darkest secrets are revealed...will she learn to trust me? I almost don't want to put on all those crappy parts again. I want to treat her like the lady she could be. Those 165mm cranks will have to go. Need to find a wheelset. She's got her issues, but at least were in therapy now! Overhauled the bottom bracket. 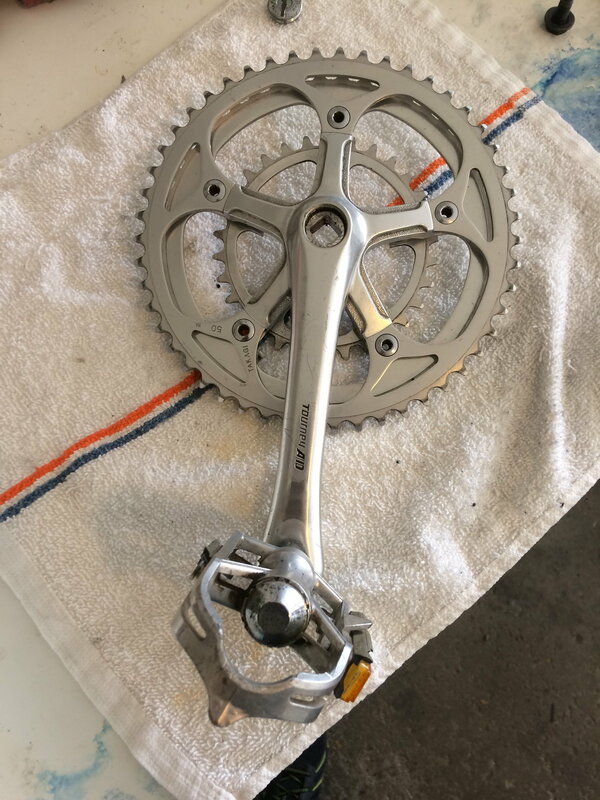 Cleaned crank. Cleaned up seatpost. Rode to bike shop for tools for a different project. 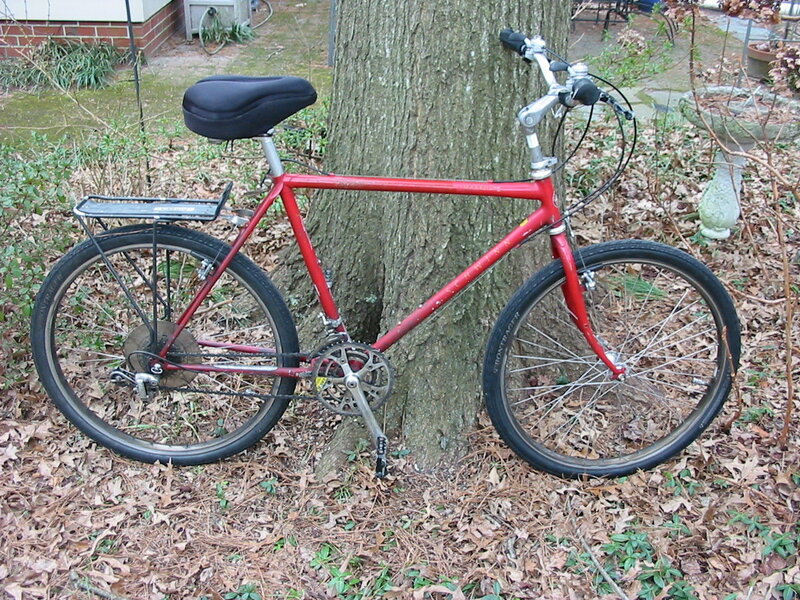 I don’t want to sell anything off this bike, it’s all original and all in nice shape. Honey are you using the nice kitchen scale to weigh your rusty bikes again??? Wow, the Clunker Challenge has started up again? While I'm all fired up about entering, reality is setting in - I have entered every year, but not once have I finished a build in time for the deadline. Riding one of these basket case heaps fine pieces of machinery 62 miles is also something I've failed to do. But, the town I live in did just have the 'large/bulk trash collection' event - it is held every other year. House after house drags piles of crap out to the curbside. The goal is to snag the bikes before the scrappers do. I came away with three this year, two are viable Challenge candidates. The other I snagged for parts. So, between upcoming vacations and large-scale system implementation/rollout at my work, I suspect time to wrench on old bikes will be less than available. What the hell, I'm in. Pics to follow. Good. Now, on behalf of everyone who had already entered this fine spectacle of an event, would you be so kind as to enter one of your BMXs so you can ride it 62mi and we'll all follow along? At any rate, it's all there: low budget Suntour Accushift, Lee Chi Sine Power brakes, and plastic brake levers. Perfect! Maybe if you use a little lube, some heat and a touch of patience Let's see if I can practice what I preach when I crack into mine! Last edited by GrainBrain; 04-14-19 at 07:31 PM. 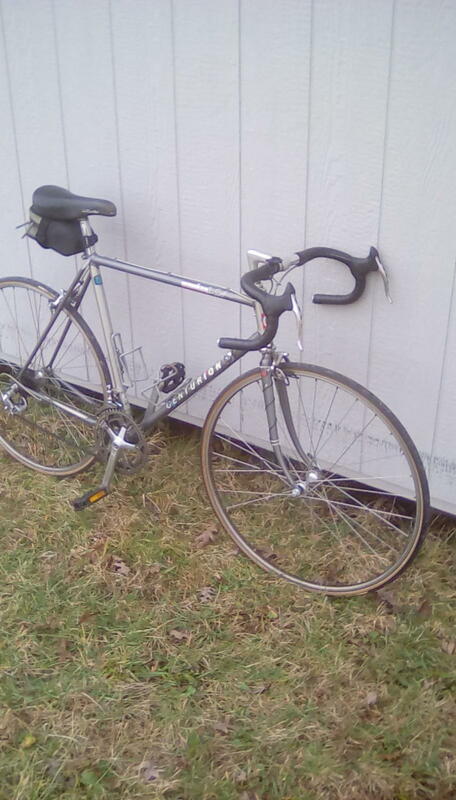 Last year (after I DNF to injuries) I set a goal of building a keeper for the clunker challenge this year. 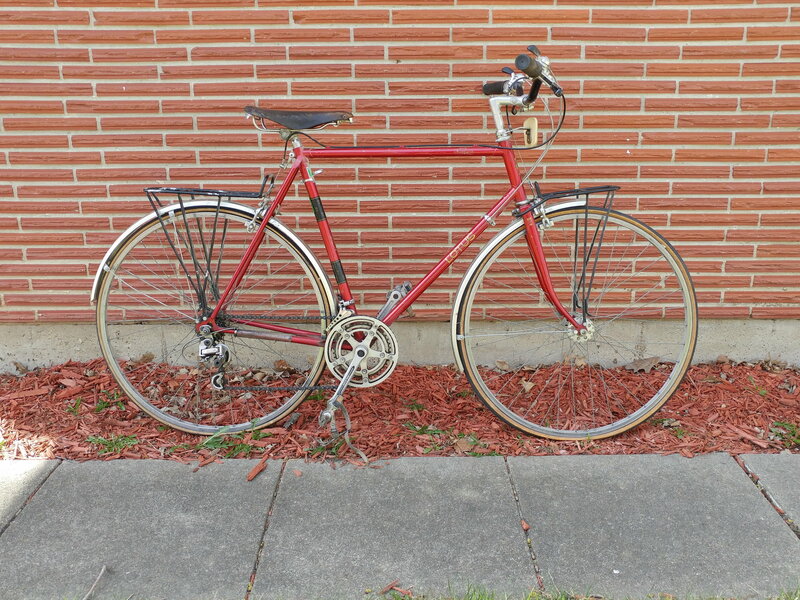 In the true spirit of restoring a C&V bike to real use I started searching last summer. And I was picky. After only a few miles of riding last year's entry of a too large 64cm Centurion Elite RS I wanted another Centurion. Actually I needed two. I also wanted an Ironman. 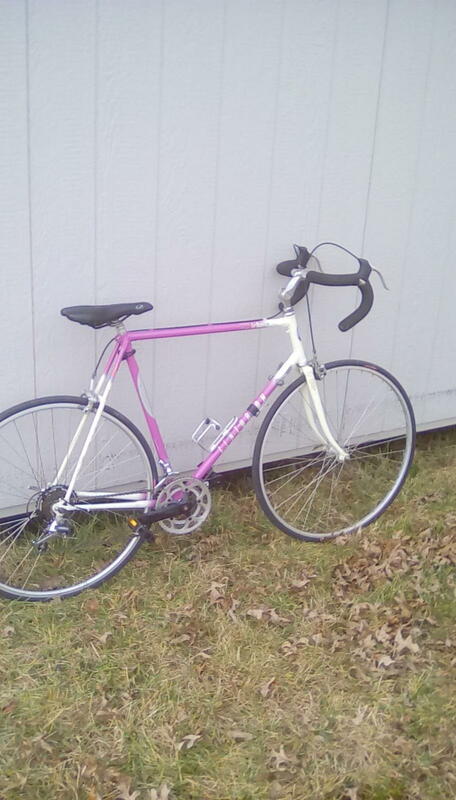 I found an '86 Lemans frame for $50 in August and then on new year's eve a 250 round trip drive got my '85 Ironman. Original except for tires. So as the junk mail always says "You are already a winner!" I've put over half the miles in already and I will post pics and numbers at random over the next few days. Hey, I'm retired and no longer organize anything. I did track the costs though, since things are tight after spending A LOT on my dog's two ACL surgeries recently. I'm thinking of renaming him Eddy Merckx. Better late than never, after 15 km of riding I finally did more that put air in the tires, reconnect the front brake cable and WD 40 the chain for the Trek 520. On Saturday I; cleaned and lubed the chain, deglazed the brake pads (sanded), and wiped down both stem and seat post and applied fresh grease. On Sunday I rode another 4.2 KM bringing me up to nearly 20% of the challenge total. 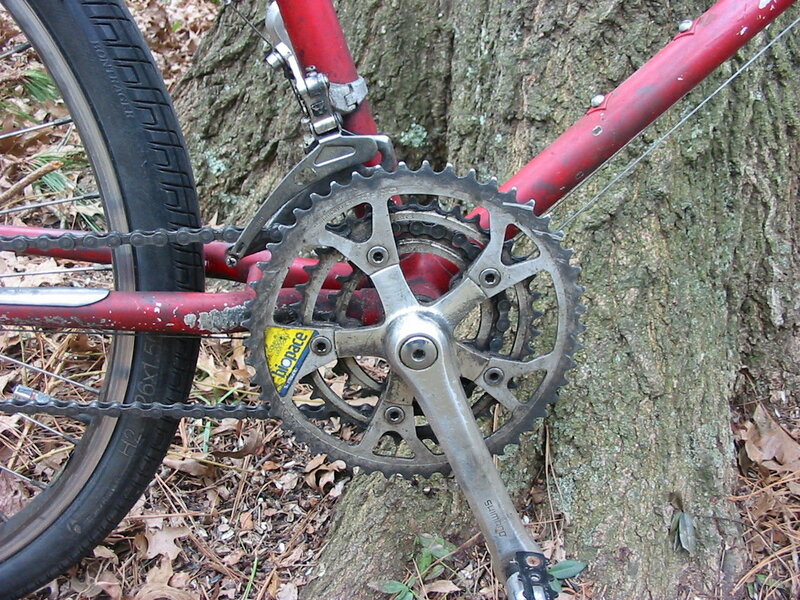 Crank threads were filthy. Threading the extractor was a chore. A shout out to Testors paint. So now I am finished except for a test ride and clipping the cables to length. No mileage yet because the wind is blowing a gale outside, but I do have photos. No photos today, but I worked late last night on the Bottecchia De Luxe and brought it incrementally closer to rideability. I cleaned most of the grime off the Universal Sport centerpull calipers and remounted them. The curved washer behind the front caliper was too shallow, and when cinched down the return springs were pressed up against the crown. Fortunately, the bin o' scavenged parts provided a thicker unit and I was able to fit that AND make it so my Y-wrench's 9mm socket worked properly to attach it. The rear brake's curved washer was cracked and actually broke while I was handling it, so I got to use a different one. Hmm. 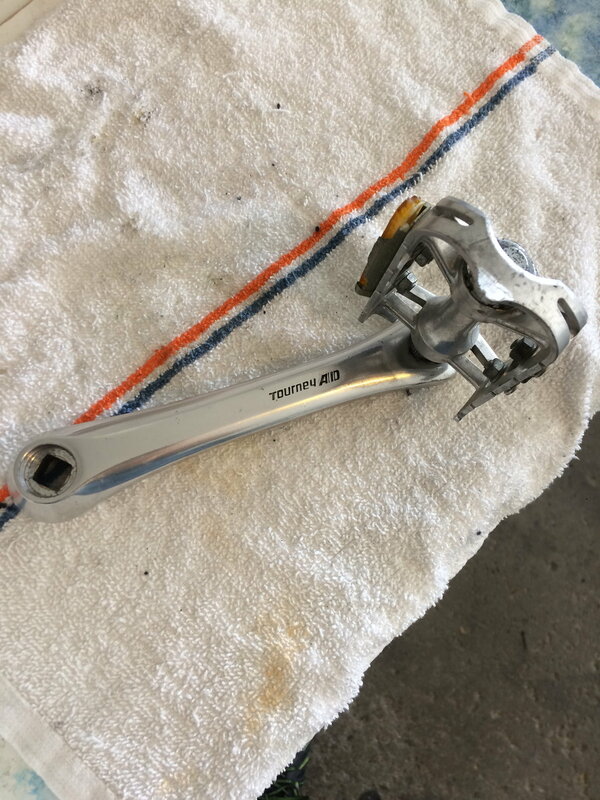 Then I removed and degreased the pulleys on the Simplex Prestige rear derailleur, scrubbed them reasonably clean and reassembled them with fresh grease. I had already slathered the derailleur body with oil to make it slightly less brittle, and it all seems to work relatively smoothly now, so I remounted it. Then I went to work on the front hub. I didn't see a name on it, which, if I had marketed it, I wouldn't have put my name on it either. Nice wide alloy flanges, stamped steel center section, no dustcaps to remove, and the worst looking, most galled hub cones I have ever seen in 45 years of messing with bikes. But hey, it's the CLUNKER challenge, so I swabbed out the worst of the old mucky grease and washed the balls and cones with degreaser and wiped them down and stuck it all back together with more fresh black grease. It felt acceptable, but not great. Fortunately I have enough room in the budget to do a wheel swap, and the wheels I would use come from a bike I paid $10 for. It may become necessary to swap wheels, because I am not at all certain I can lay my hands on a puller that will remove the Caimi freewheel. and that rear hub just feels wretched, as in Wally World Huffy left out in the rain for a decade wretched. Clunker challenge, though, so if need be I just flush everything with WD-40 and dump some Tri-Flow in after it and run it into the ground, right? Overhauled the headset today. Man, it was nasty, old dried up gummy grease. One of the ball bearings was missing out of the retainer on the top. No signs there was ever one there. I cleaned everything up as best as I could and repacked and it works much better, although I did just reuse the original bearings. I think the headset will be replaced before I put it into commuting duty and it works fine as is enough to finish the challenge. 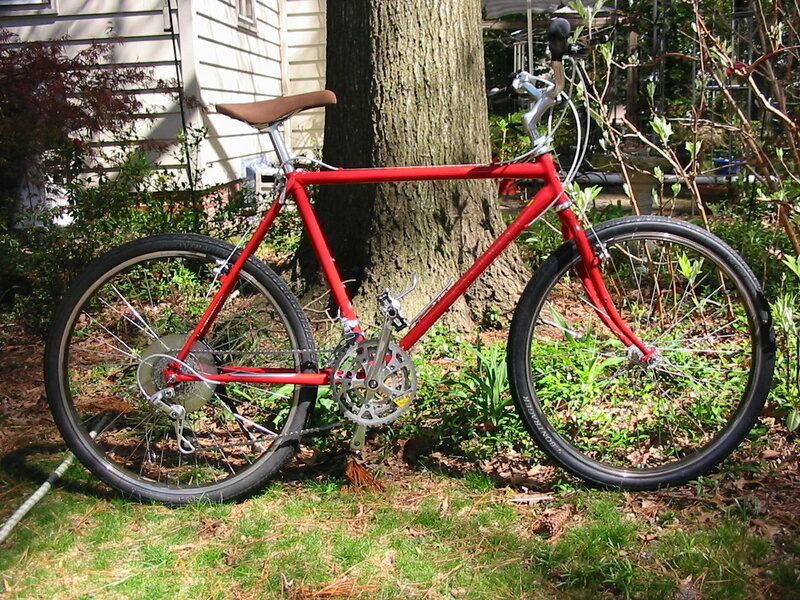 I really want to ride the bike, it’s taking a lot of discipline to stay off it until I overhaul the hubs. Way easier and cheaper to replace a headset than a wheelset. These wheels are cool, too, at first I thought they were chrome steel but they’re polished alloy. They spin true. I think some Voyageurs came with a 40 spoke rear but these are 36 front and rear. I seem to break about half a dozen drive side rear spokes every year. That's what I did last year, just get it working enough to make it to the 100 km mark. It was protesting very loudly by the end, but it made it. This year I intend on donating the bike, so I had to at least get it to where it might last a few more miles after I'm done with it. There's a teaser in there for what I might try to do with the rebuild. Last edited by tiredhands; 04-16-19 at 10:02 AM. @Phamilton, you're breaking too many spokes. I want to say you're doing something wrong, but probably, the original owner of the rear wheels did something wrong. I see learning the skill to build wheels in your future. I just taught yet another person to build wheels, and he's very satisfied. 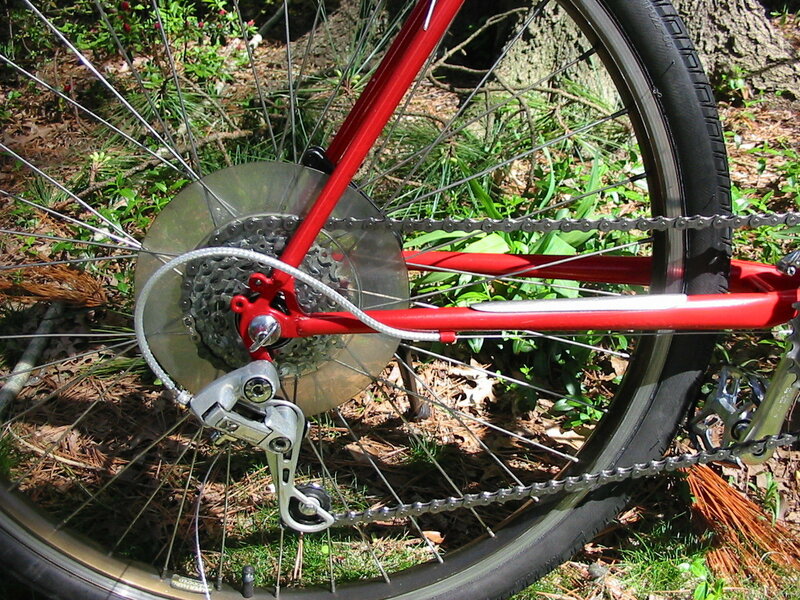 You will love it, and you will not break spokes any more. @tiredhands, I don't see your pictures. Check the permissions. Thanks! I'm getting the hang of switching to Google Photos. Should work now! Thanks. I went for the test ride this afternoon - shifting and braking is fine. It feels light and responsive, but I need to adjust the saddle height and turn the stem a few degrees to the left. It may turn out to be too small for me, but if that is the case I'll get my wife to try it. It is way better than her Trek 820 Antelope. These have all been older used wheels anyway, probably machine built. 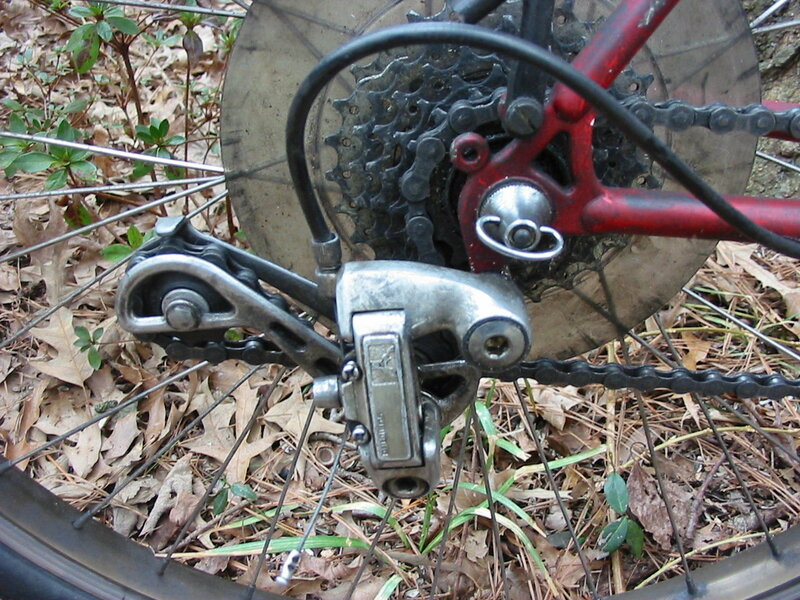 My understanding (and please correct if wrong) is that older machine built wheels often have issues with drive side spoke breakage at the "elbow" or whatever you call that part, where it goes into the hub flange. Something about needing stress-relieving. All my broken spokes have broken there. 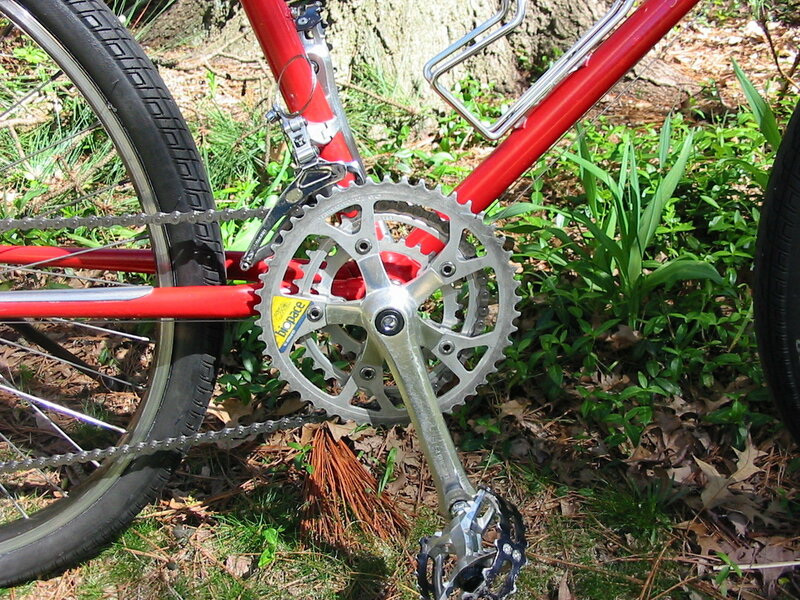 I have some old tall flange hubs w/ 27" steel rims that I think I'd like to lace up to some alloy rims and replace the 5 spd FW with a single speed. That would be my first wheel build project. I think tall flange hubs look cool. My favorite thing about this bike is the iridescent pearl over teal paint! 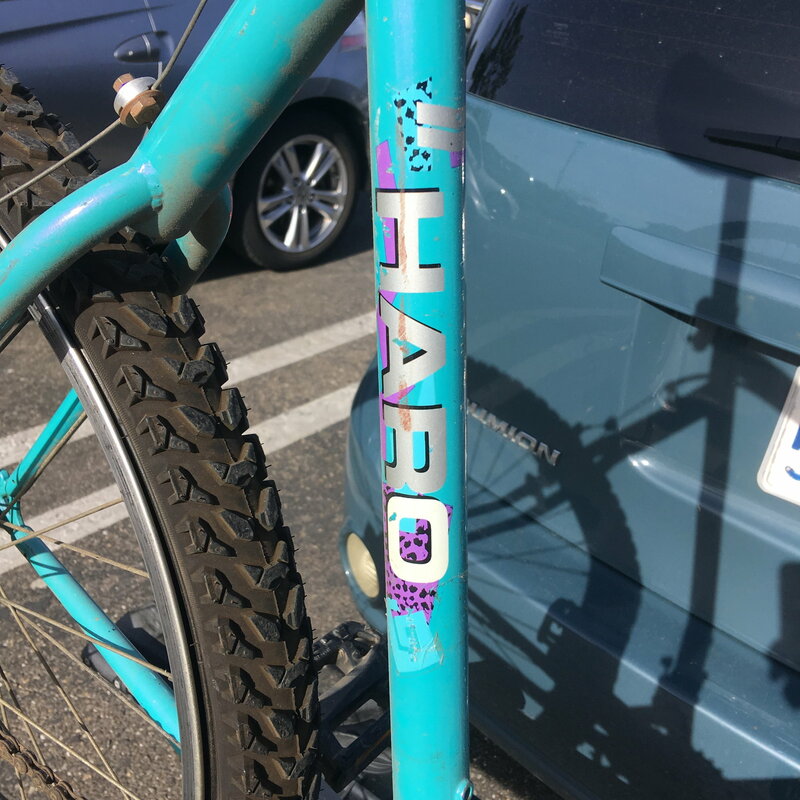 I purchased this 1988 Haro Impulse at a local thrift store for $16.15 (tax included) with the intention of making a bar bike out of it. It was mostly there, save the munched derailuer hanger, and seatpost that was mounted backwards. Came with a Tigoa Farmer Johns Cousin, but I wasn't perpared to ride on a 30 year old skinwall tire. 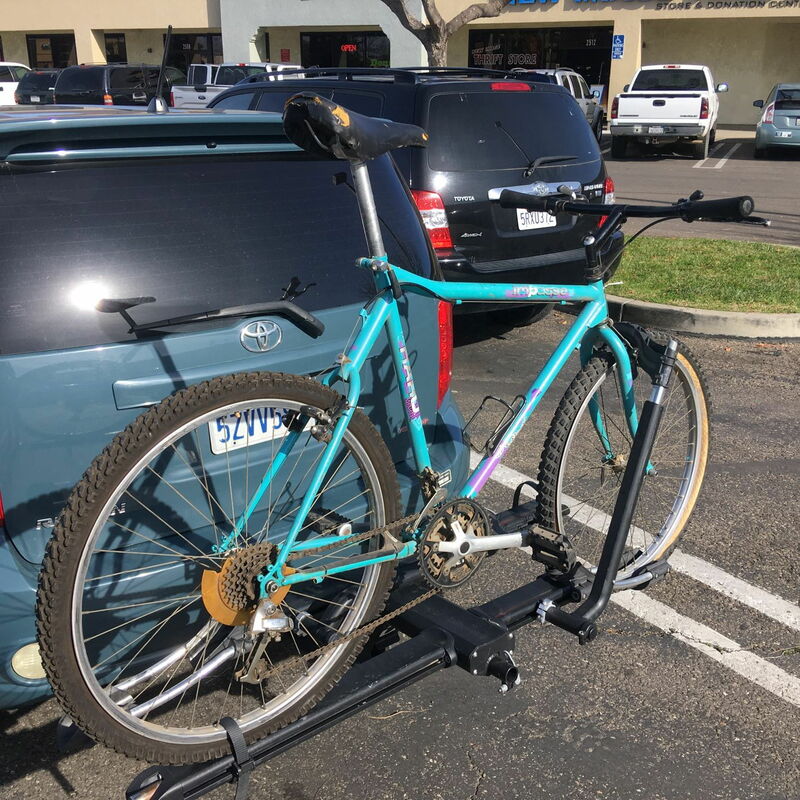 To get it rideable, it needed to have the derailleur hanger straightened (free) and new derailleur cables and housings ($7). To get it nice, I added a new chain ($8.25) and a Juliana seat from used seat box from my LBS ($15), plus a set of grips ($3) and a couple of used Specialized Armadillos ($10) and a new set of generic platform pedals ($15). Oddly, the tubes were good. Overhauled and trued the wheels, my friend rode it about 10 miles, and I noticed the bottom bracket also needed to be overhauled. So I haven't got the 100K on it yet, but I'm working on it. Last edited by CraigMBA; 04-16-19 at 02:22 PM. Reason: Added more pictures.